While Quinoa(pronounced keen-wah) is considered by most people to be a grain because it cooks up much like a grain would, it is actually a seed. When cooked it has a wonderful nutty flavor. It is very versatile and can be used as a main dish, side dish, baking or breakfast. It can easily be included in soups, pilafs, cookies, muffins, or even veggie burgers. Quinoa is an excellent non-animal source of protein. 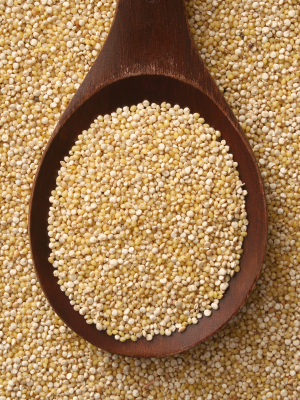 Only 1/2 cup of uncooked quinoa contains 12g of protein, almost 1/4 of an average person’s daily requirements. A diet lacking in protein can result in many health problems varying from lethargy and irritability to serious skin conditions, wasting muscle and a weakened immune system. Amongst protein, manganese and iron are also great benefits of Quinoa. Again, only 1/2 cup of uncooked quinoa provides about 95% of your daily requirement of manganese – a mineral that helps maintain strong, healthy bones. Found mostly in our red blood cells carrying oxygen to our heart, lungs and brain is Iron. In doing so it keeps our minds alert and bodies energized. Not having enough iron can lead to anemia. The most common symptoms of anemia are weakness and fatigue. One reason people who are iron deficient get tired easily is because their cells don’t get enough oxygen. This can be cured by including a 1/4 cup of quinoa in your diet, which contains 20% of your recommended daily iron intake. Quinoa is a healthy, gluten free, whole grain food and you should enjoy it guilt-free! No wonder it is listed as one of the top ten super foods! For a great breakfast idea click HERE.